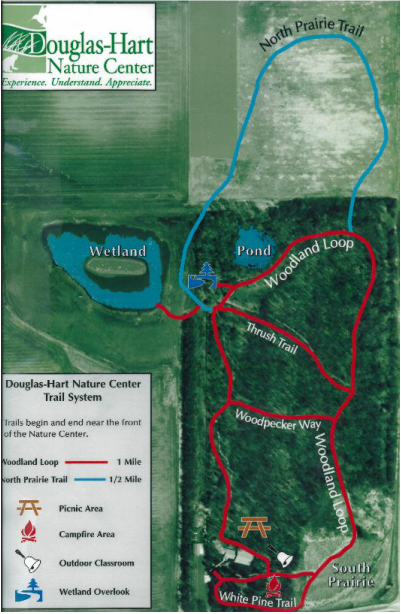 Trails at the Douglas-Hart Nature Center are a limestone chipped surface making them ADA and stroller accessible. Two miles of groomed trails take you through native Illinois habitats: prairie, forest, pond, and wetlands. Take a leisurely stroll, brisk walk or run like the wind! Allow your senses to take over. Listen to the birds singing and the leaves fluttering in the breeze. Observe the animal community as it goes about its daily routine. Look for woodland and prairie wildflowers. Smell the pine trees, lush green grasses, trees, fruits, and flowers. Enjoy! Our trails are open 365 days a year during daylight hours. They begin and end near the Visitor Center. A self-guided trail booklet is available at the center. Benches are conveniently located along the trail. Pets are welcome, but must be kept on their leash. Children's wagons or a hiking backpack are available for use on the trails, pick one up in the visitor center. Picnic tables area available to the public - during field trips season the picnic area is reserved for large school groups. Please use the picnic table at the front of the visitor center or campfire area instead.